What is so special at 8 pm that I forget all my important works? What is so special at 8 pm that I don’t care for anyone around me? What is so special at 8 pm that I can’t take my eyes off from television? Do I need to answer? I guess..No. Because everybody knows that at that time an epic comes who has stolen millions of hearts and now has taken the pledge of not returning them! It is none other than the show never created before – Devon Ke Dev…Mahadev. What can I say about it? It is incomparable and unbeatable. Earlier I always used to think that TV serials are really very disappointing. But now it is worth watching. 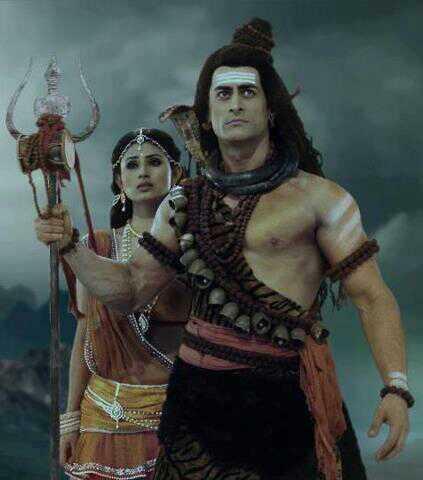 It is worth watching because of Mahadev. It is not wrong to say that Mahadev has created a benchmark by its performance , by its presentation and by its conceptualization. I can’t even imagine the hard-work done by all the actors and the team to bring out such a brilliant performance. 18th December 2011…This is when the journey had started. The journey of being the best show ever. Sati sees Shiva for the first time..so magnificent. Sati’s realisation of being Aadishakti….so epical. And finally Shiva-Sati Milan which gave birth to the “First Love Story Of The World”..Then the separation, Shiva’s pain and agony…heart-breaking. But as everyone says “True Love Never Dies”.. Here too , Sati came as Parvati and She completed Mahadev. All the characters were portrayed so perfectly. The personified beauty on earth , Mouni Roy as Sati. Mouni has played the role of Sati so gracefully. The charming and beautiful Sonarika Bhadoria and now Puja Bose as Parvati is doing a great job. Mein to vairagi hun , Na samman ka moh , Na apmaan ka bhay. Mein vo hun , jo nahi hai. Aur jo nahi hai , vo mein hu. Shiv aur Shakti ek hai. Maine tumse prem karna choda hi kab tha Sati. Prashn mein hi uttar hai , prashn mein hi samadhan. Disha ko bhatakna hi disha ko pana hai. Mahadev to ek bel-patra se bhi khiche chale aate hai. And about Mohit , He has portrayed his every avatar beyond perfection. And his dimples are to die for. Okay , looks like Mohit is distracting me from my topic! Mahadev is a part of my life now. A day without Mahadev on TV is as dull as darkness. Now , it has completed 500 episodes , thus hitting another milestone. I say , 500 is just the beginning..there are still many many more to come. I especially want to thank the director , Nikhil Sinha for bringing such a ravishing show. Although , different from the topic , but I really can’t thank enough for giving me Mohit Raina and Mouni Roy…the best pair ever! Lastly just want to say that this show has changed my life..
Priyanshi Gangwar is a Mahadev Fan and Dramas and Dreams is glad to honour her passion by publishing her piece. If you too want to be a reviewer-viewer at D&D, follow us at @dramasD on Twitter. Beautiful Priyanshi! Heart touching! You brought out every point with utmost simplicity and beauty! Kudos. Beautifully written Priyanshi! 🙂 Your article transported me to the first episode! Nostalgia all the way! 😀 Bravo!